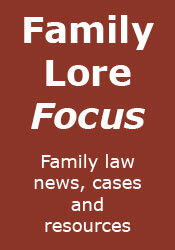 A laissez-faire approach to family law - Could this be where our law is going? Euthanasia instructions in lasting powers of attorney ruled ineffective - In the case The Public Guardian v DA & Ors. Divorcees, particularly women, can be happy - As suggested by a recent survey. Wife may lose property after husband convicted of fraud - The case National Crime Agency v Hajiyeva.